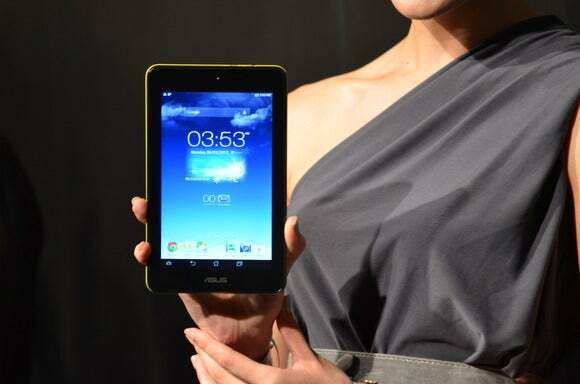 “I’m using it every day,” said Asus chairman Jonney Shih during a news conference. Tablet makers have been dropping the prices of Android tablets with small screens. Earlier this year, Acer introduced the $169 Iconia A1 tablet, while Hewlett-Packard launched the $149 Slate 7. Google’s popular Nexus 7 and Amazon’s 8-inch Kindle Fire HD sell for $199. 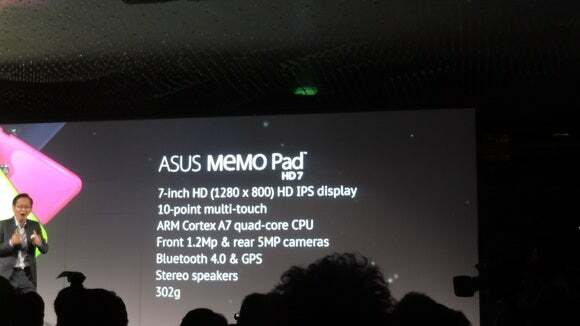 Asus Chairman Jonny Shih announcing the Memo Pad HD7 at Computex. The tablet runs Android 4.2.2 and has a quad-core Tegra 4 chip, which includes a Cortex-A15 CPU and 72 graphics cores. This is the second tablet based on the Tegra 4 chip: the first was HP’s Slatebook X2. The Transformer Pad Infinity has a 2560 x 1600 pixel display, a higher resolution than the 2048 x 1536 pixel screen on Apple’s latest iPad. It is the same resolution as Google’s Nexus 10 tablet. The Asus tablet’s USB 3.0 port makes it stand out from the crowd: Most tablets today have micro-USB 2.0 ports, handy for charging devices. Updated at 9:35 a.m. PT with a video report from IDG News Service.